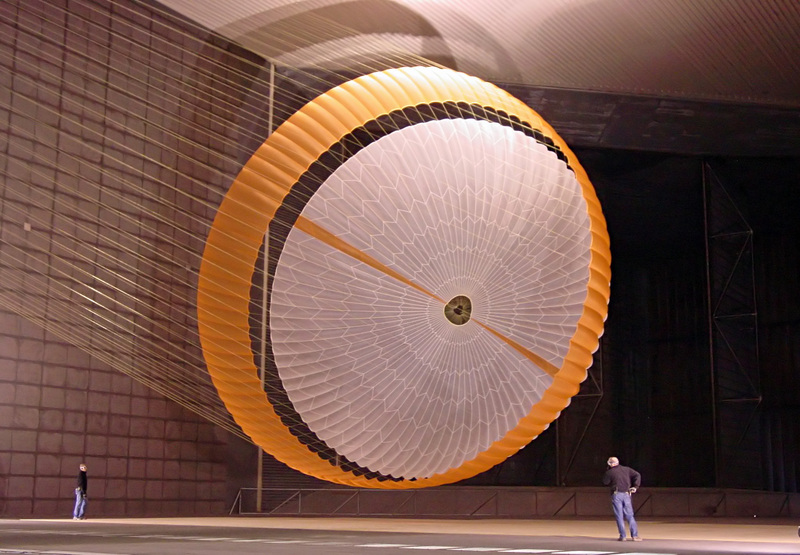 The parachute for the Mars Science Laboratory (with the Curiosity rover) was tested in the NASA Ames Research Center 80 by 120 Foot Wind Tunnel. The wind tunnel is currently capable of air speeds up to 100 knots (190 km/h; 120 mph). But how was the parachute tested with a speed and pressure similar to a real entry to Mars? Only by scaling speed and air viscosity or by using a smaller model parachute instead of the original size? Picture and speed data from Wikipedia. The full scale wind tunnel testing did not attempt to duplicate Martian conditions. provide an end to end test of the parachute system from mortar fire to parachute inflation. a multi-phase delta qualification by analysis and subscale supersonic wind tunnel test program to address the fundamental physics of the supersonic operation of DGB parachutes as a function of Mach number , parachute size, and capsule wake interaction. The first phase is computational fluid dynamics (CFD) of a 2% scale rigid parachute canopy and capsule validated by a 2% scale wind tunnel test of the rigid configuration over the MSL Mach and Re number deployment range in the Ames 9x7 ft. unitary tunnel. Phase two is fluid structure interaction (FSI) analysis of a flexible canopy with capsule validated by 5% scale wind tunnel tests over the MSL deployment Mach and Re range in the GRC 10x 10 ft. unitary tunnel. The final phase is the application of the validated FSI tools to the prediction of the full scale para chute performance in Mars type deployment conditions providing predictions of supersonic drag performance, stability, and canopy loading. Not the answer you're looking for? Browse other questions tagged testing parachute or ask your own question. Conditions and sensors that can be used for parachute deployment?